Instructional design commenced during the World War II when several psychologists and education specialists were asked to create training materials in mass for several thousand soldiers. Tests were also administered during this time to assess learner’s abilities. 1954 – B. F. Skinner’s published an article titled “The Science of Learning and the Art of Teaching” suggested that programmed instructional materials, should include small steps, frequent questions, and immediate feedback; and should allow self-pacing. This type of instruction is based on theories of “operant conditioning”. 1956 – Benjamin Bloom develops the “Taxonomy of Educational Objectives” identifying principal domains of learning. Today, the output of this work is referred to as “Bloom’s Taxonomy”. In 1965, Robert Gagne described three domains of learning outcomes (cognitive, affective, psychomotor), five learning outcomes (Verbal Information, Intellectual Skills, Cognitive Strategy, Attitude, Motor Skills), and nine events of instruction in research called “The Conditions of Learning”. This work sits at the very core of instructional design practices today. Several models surfaced that are based on systems information processing. This approach was developed across military, academia and organizations. These organizations also started to use media such as filmstrips during this time to improve the effectiveness of instruction. 1983 – David Merrill developed Component Display Theory (CDT), which concentrates on the methods of presenting instructional materials. 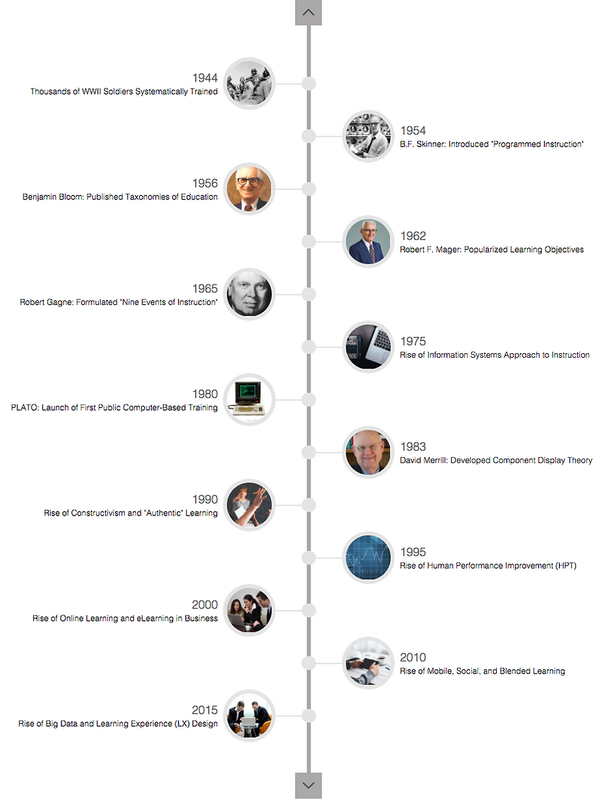 PLATO (Programmed Logic for Automatic Teaching Operation), was one of the the first commercialized computer assisted instructional system allows computers to be]integrated into instruction. Risings interest in the principles of cognitive psychology (or cognitivism). The influence of constructivist theory within the field of instructional design became more active in the 1990s. Constructivists state that learning should be “authentic” and produce real-world learning experiences that allow the learner to form, and construct their own knowledge. Performance improvement and performance support was a fast growing trend in the 90’s. Rapid prototyping was also first seen during the 1990s. In this process, training materials are prototyped quickly and then revised through rapid testing and iterations. Computer Based Training (CBT) delivered via CD-ROM became a common vehicle to deliver interactive training. With improved internet penetration online learning (or “eLearning”) becomes much more prevalent in the corporate sector. Companies start to use online learning for on-boarding new employees and developing new skills. Rich instructional media including video and simulations became possible as internet bandwidth improved. Initially online learning is delivered via Learning Management Systems (LMS), which allowed for a single one stop shop to manage, deliver, and track online learning courses and assessments. With the infusion of smart phones and tablets into corporations and homes, mobile and social learning becomes starts to penetrate the industry. “Blended learning” (a combination of in-person training + online learning) is commonly used both in education and industry to deliver training experiences. Today instructional materials are much more personalized and targeted as a result of “Big Data” and analytics. Today, the focus is not just on learning outcomes but also on the overall user experience of the learner. This approach has given rise to Learner Experience (LX) Design which focuses on the process of creating learning experiences that enable the learner to achieve the desired learning outcome in a human centered and goal oriented way.